Now, all I have to do is my part - The BSB SportzMan - A Forum for OutdoorzMen! It's usually easier to blame the rifle rather than the rifleman. I guess I don't have that luxury this year. 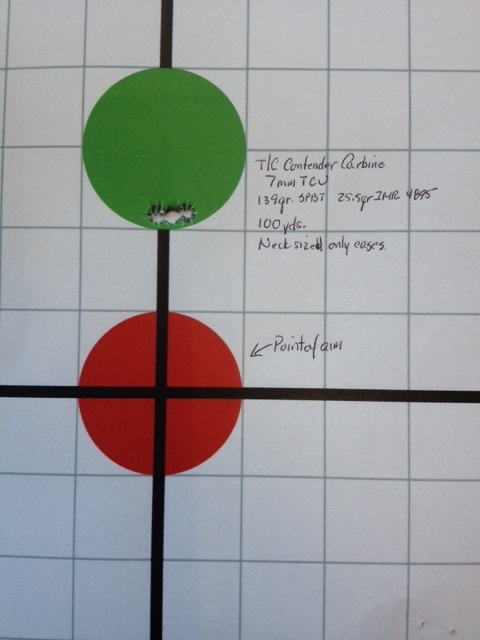 This was shot out of my T/C Contender Carbine in 7mmTCU with a stock 21" barrel at 100 yards. The load is 25.5 grs. of IMR-4985 under a Hornady 139 gr. SPBT. This point of impact is 2" high at 100 yds which is where I sight in my hunting guns. I'll have to run a point blank range test on it at some point. This is when I wish I owned a chronograph. Very good 788. It looks like you're ready. When do you get to go hunting? hunting speed goats with 30 Herrett next week. I just got home from hunting Antelope. It opened October 1st. I'll post the story and pictures in the big game section.